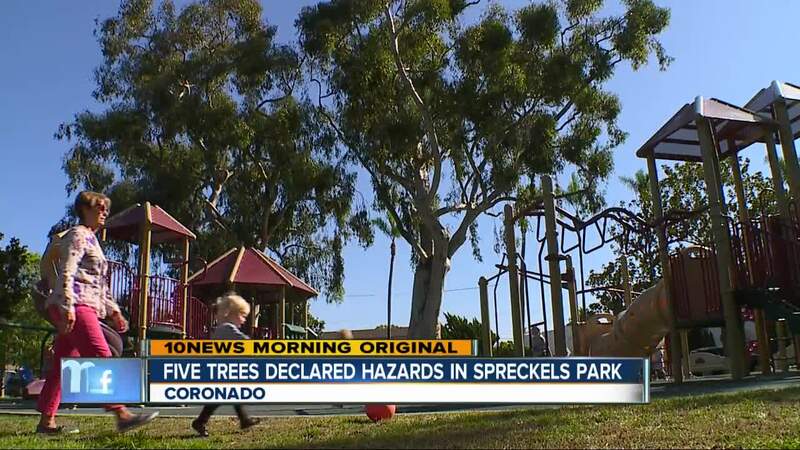 CORONADO (KGTV): Five trees at Coronado's Spreckels Park may need to be cut down before they fall down. The trees, all of them Sugar Gum Eucalyptus, are either at "High" or "Moderate" risk of failure, according to an arborist's report presented to the City Council last week. One tree, the one deemed the highest risk, is already scheduled for demolition. That will happen Tuesday, starting at 6 am. That tree is in the Northeast corner of the park. The other four will be monitored, including two trees with branches that hang over the children's playground. The city hired West Coast Arborist to study all 95 trees in the park after a pine tree collapsed in September. City Code gives the Department of Public Services the authority to decide which trees should or should not be cut down. According to the rules, trees will be removed if they present, "a condition that is hazardous, are in declining or poor health and the condition cannot be corrected by pruning or any other means." Since 2010, the city has removed nine trees from the park. Five other trees have either fallen or had branches fall off.